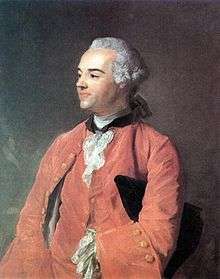 Jacques Cazotte (French: [kazɔt]; 17 October 1719 – 25 September 1792) was a French author. 1 2 3 4 The Arabian nights : A Companion. by Robert Irwin. London, Allen Lane, 1994, ISBN 0-7139-9105-4 (pp. 260–5). ↑ Wells Chamberlin, "Jacques Cazotte" in Supernatural Fiction Writers, edited by E. F. Bleiler. New York: Scribner's, 1985, ISBN 0-684-17808-7 (pp.29–35). ↑ The Arabian Nights in Transnational Perspective edited by Ulrich Marzolph. Wayne State University Press, 2007 ISBN 0814332870 (p.34). This article incorporates text from a publication now in the public domain: Chisholm, Hugh, ed. (1911). "Cazotte, Jacques". Encyclopædia Britannica (11th ed.). Cambridge University Press.